The Perfect Retrieve -- 4-Disc DVD Set. $94.95. "If anything these DVD's have given me the confidence, patience and direction that I needed." As a first time Dog owner I realize that my dog is not the one being trained here. After struggling with trying to Force Fetch him myself last Spring, I left him with a Professional Trainer for a month who also did not get the results we had hoped for. Without giving up I ordered these tapes to try again. If anything these DVD's have given me the confidence, patience and direction that I needed. I just started this week and so far I'm seeing much better results. During my training sessions last year I can see now that I was nervous, less patient, and confused on how to carry each session out. I see now following the direction each training session is much more enjoyable for me and my Dog. I would recommend these DVD's highly for dog owners and trainers of all levels of experience. "I recommend Perfection Kennels videos to anyone interested in training." Being a GSP trainer for the past fifteen years, I've watched dozens of training DVDs including Perfection Kennels earlier productions. 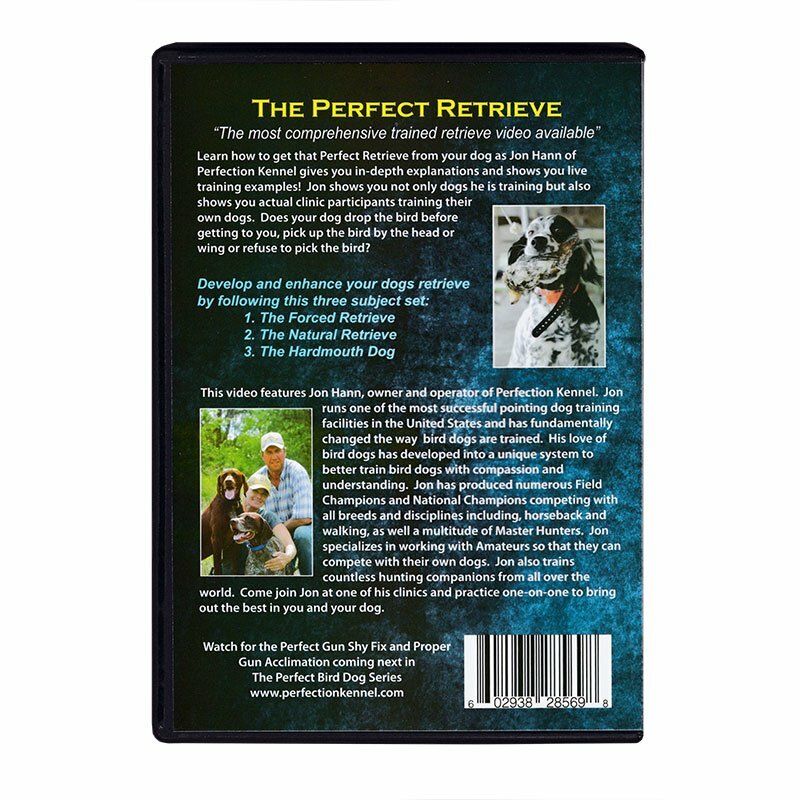 This new set of four DVDs are specifically about retrieving, one of the best and worth the investment. A trainer should never stop learning as there will always be a new challenge. I recommend Perfection Kennels videos to anyone interested in training. "Excellent, as anything Jon has done." Only problem is where he put the visual of when he is stimulating the dog, it's too far away from his hand and hard to see that and the technique. Excellent, as anything Jon has done. "This is the best video I have seen on retrieve training." This is the best video I have seen on retrieve training. I recommend all of the Perfection Kennel's videos by John Hann. Great video for anyone, no matter your knowledge level of bird dogs and training. Really great videos!!! "The many hours of instruction on real dogs not previously trained also helped me." I really appreciate Jon's approach in respecting the dog and all Jon's years of experience training. From watching his video I learned my dog is a natural retriever and I may not have to force train her. The many hours of instruction on real dogs not previously trained also helped me. English Setter and Brittany. Hunts. Mr. Hann is a competent trainer but he leaves a few things out of training a dog to retrieve with an e-collar. I have trained force retrieve with a toe hitch and ear pinch but I wanted to try it with an e-collar (Tritronics 550) The first thing he fails to mention because of political correctness is one has to hurt the dog to get them started with an e-collar just like one does with a toe pinch or ear pinch. The dog will vocalize until they know how to turn off the stimulation. This was disingenuous, and he finally admitted to me that he does not cover that because of political correctness. The second thing is the electricity from the e-collar sometimes actually keeps the dog from finishing the fetch command. One can see the dog shake even if he does not vocalize on level 2 or 3 and refuse to open his mouth. I am not a professional trainer but I am presently doing seven dogs at once. Two of the dogs are almost finished, one is on the ground retrieving frozen birds close to the table, and four are retrieving frozen birds on the table and are ready to start on the ground. I had one setter who was progressing well, but had to put him back on the table when the e-collar was not getting the job done. He quit running to the frozen bird when I applied more electrical pressure. I reworked him with a toe pinch and he is retrieving again. I have found using the traditional pinch methods with an e-collar backing it up works best for me. My number one guru Rick Smith suggested this. I did like Jon Hann's use of praise for the dog when the dog has the buck, plastic pipe or bird in his mouth. This is not like the silent command method I am used to but I can tell that the dogs are responding to petting and praise when they do it right. I called Mr. Hann twice and he generously responded to me by email and voice conversations, But basically he criticized me for not having the proper timing and in order to learn that timing I should come to one of his clinics. He has force retrieved trained thousands of dogs. He guarantees he can have a dog retrieving within four days. I've been at it on these seven for a month and feel I still have a couple more weeks to go. So I guess I just don't have the proper timing. His disk on the natural retriever is good, and I enjoyed his technique on diverting the attention on a hard mouthed dog and get him to walk with the bird. All in all it is a good CD set, but I feel he is using the instruction to get people to his seminars. Learn how to train your own dog to love retrieving! Learn how to get that Perfect Retrieve from your dog as Jon Hann of Perfection Kennel gives you in-depth explanations and shows you live training examples. Hann shows you not only dogs he is training but also shows you actual clinic participants training their own dogs. Does your dog drop the bird before getting to you, pick up the bird by the head or wing, or refuse to pick up the bird? If your dog doesn't like retrieving, has a feather aversion or is hard mouthed, this video will show you how to get a reliable happy retrieve! Hann runs one of the most successful pointing dog training facilities in the United States and has fundamentally changed the way bird dogs are trained. His love of bird dogs has developed into a unique system to better train bird dogs with compassion and understanding. Hann has produced numerous Field Champions and National Champions competing with all breeds and disciplines, including horseback and walking, as well as a multitude of Master Hunters. Hann specializes in working with amateurs so that they can compete with their own dogs. He also trains countless hunting companions from all over the world. These DVDs let you join Hann at one of his clinics and practice one-on-one to bring out the best in you and your dog!